Each sector contains information about the main factors influencing growth and development of the particular sector. Each industry is summarised but the emphasis is on the role of the Department of Agriculture and how it has contributed to growth of individual sectors. In the fledgling colony livestock were essential for draft animals (bullocks and horses) and food (meat, milk, eggs). Due to the perishable nature of meat, most production was marketed locally. Prior to refrigeration export of “meat” from South Australia was achieved by overlanding cattle or sheep interstate, particularly to the Victorian goldfields. Early development of South Australia’s livestock industries commenced with cattle and sheep being driven overland from NSW in 1838. Initially sheep and cattle industries developed in the higher rainfall, better pastured areas in the Adelaide Hills and then expanded as settlers moved out from Adelaide to the north, east and south squatting on land. Further expansion occurred as explorers discovered new land. Even before the Department of Agriculture was formed in 1902, Acts of Parliament relevant to livestock were enacted. This included sheep scab (1840), entire horse (1839), stealing cattle (1840), control of domestic dogs (1852), the Stock Act (1861) and Stock Diseases Act (1888). To this day PIRSA has played an important role in development of livestock industries through regulation of diseases, meat hygiene, meat processing, stock food, stock medicines, disease compensation, poultry and milk processing. Many of these early squatters had their land converted to pastoral leases. Demand for products expanded as the population increased with the discovery of copper at Kapunda and Burra. Once local demand for meat was met the only export products were tallow (for candles) and skins. As a consequence tanneries and boiling down works were established near the sale yards on the northwest corner of Adelaide. Wool, being a non perishable product was exported to Europe, providing raw material for the expanding woollen mills. 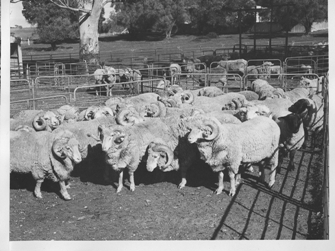 Rapid expansion of the wool industry triggered establishment of large stud flocks producing sheep suited to South Australian conditions. Wool production per sheep and quality increased dramatically. 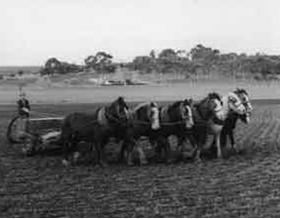 As the demand for cropping land increased and expanded out from Adelaide, supported by Acts of Parliament in the 1860’s, much pastoral land was resumed for closer settlement and cropping. While initially the farming rotations were wheat/fallow, there was a gradual build up of sheep flocks on farms and the “mixed farm” came into fruition. Sheep, in many cases, contributed as much as cropping to the farm income. Due to the almost subsistence nature of many of the farms, pigs, poultry and dairying were incorporated on most mixed farms. This was to utilise “waste products” and supply a steady income and food source throughout the year. Poultry were fed lower quality grain with the resultant eggs used domestically and surplus sent to Adelaide by train for local consumption or pulping for export. 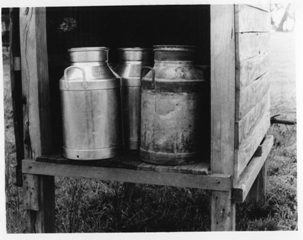 Most farms milked a few dairy cows to provide milk, cream and butter. Surplus milk was separated into cream and throughout the agricultural areas dairy factories sprang up to make butter for local and export use. Pigs were added to the enterprise mix to utilise surplus grain and the skim milk. From colonisation to the mid 1850’s flocks and herds gradually increased and then for the next 80 years fluctuated in size with droughts and changes in markets. For instance South Australian cattle numbers fluctuated between 200,000 and 400,000 until the early 1950’s. Following World War 2, development of Soldier Settler blocks, new technology to solve “coast disease” (cobalt, copper and selenium deficiencies), and development of sub-clover and medics resulted in the opening up of the Ninety Mile Desert and ability to increase pasture production in all high rainfall areas. The wool boom of the 1950’s and then the cattle boom of the 1970’s saw livestock numbers escalate only to crash after the wool reserve price scheme failed and the American beef market collapsed. Export Lamb Competition arranged by the South Australian Branch of the Society of Breeders of British Sheep. 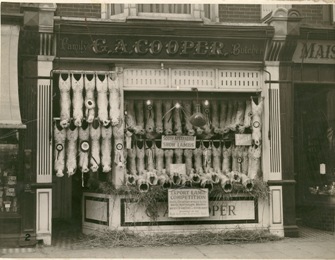 They were shipped by the South Australian Government Produce Department to this butcher located in Portsmouth, England. Date: 1910. The lamb and sheep meat industry was developed in parallel with the wool industry, utilising surplus merino sheep as mutton and as breeding mothers to produce prime lamb. Lamb production was initially for the local trade, then with development of refrigeration, in the 1880’s, export to the UK grew dramatically. The entry of the UK into the European Common Market saw significant decline in lamb exports. More recently development of the USA market has seen a surge in lamb production and exports. Breeds used for lamb production have varied as the markets changed. The UK market wanted small, very fat lambs while today’s market wants a large carcase with minimal fat. During the 1960’s pig and poultry production moved from primarily small sideline, often “free range” operations on mixed farms, to housed intensive production. Feed was initially mixed on the farm. More recently a substantial feed milling industry has developed to supply these industries. South Australia has played a key role in developing the nation’s pig and poultry industries. Initially, dairies were situated on the Adelaide Plains to supply fresh milk to the Adelaide population. Production then expanded in the Adelaide Hills and Murray Swamps. Increased production exceeded local demand for fresh milk, and export of cheese, dried milk powder and butter fluctuated with production and export markets. Over time dairy farmers have been forced off the Adelaide Plains by expansion of suburban Adelaide. More recently economic forces have resulted in the dairy industry relocating from the Fleurieu Peninsula and Adelaide Hills to the South East. Supporting livestock industries are saleyards, abattoirs, dairy factories, wool processing and meat processing facilities. We have seen the rise and fall of large abattoirs at Gepps Cross and Port Lincoln plus many smaller ones across the State along with many towns having saleyards and dairy factories. The livestock industries have been large employers of people and the mainstay of many country towns in their early days. W Stephen (Brick) Smith was a well respected Chief Veterinary Officer in the Department of Agriculture. Having joined the Department prior to World War Two he returned from active service following the war and was appointed Chief Inspector of Stock in 1955.Further information on his career cab be found in his obituary. Following his retirement in 1973 he maintained his veterinary interests including researching the history of animal disease in South Australia. This paper provides the results of his research into early livestock introductions into South Australia, their care and the difficulties associated with the very different environment to Europe. Stock arrived from other colonies and all over the world. Quarantine requirements were in place from soon after the colony’s establishment, however disease knowledge was limited and numerous diseases impacted on livestock production. Two of the earliest regulations were to prevent sheep scab and in cattle, pleuro-pneumonia. Rabies in dogs and foot and mouth disease in camels from India was of concern at one stage. It is amazing that freedom from serious diseases of our domestic animals was so successful. The paper goes on to discuss a wide range of diseases which do occur in South Australia and details their introduction. It concludes with some notes on early “Disease Control Personnel”. Further information on facilities that have played a key role in assisting development of the livestock sectors in particular regions is contained in “Department of Agriculture as an Organisation - Locations” and in the various links in the paper.